We recently published another solid new case study with the California Academy of Sciences, which is a multifaceted scientific institution committed to cutting edge research, educational outreach and finding new and innovative ways to engage and inspire the public. The non-profit Academy uses online video to expand its audience beyond the San Francisco area, allowing people from around the world to connect with its mission - to explore, explain and protect the natural world. 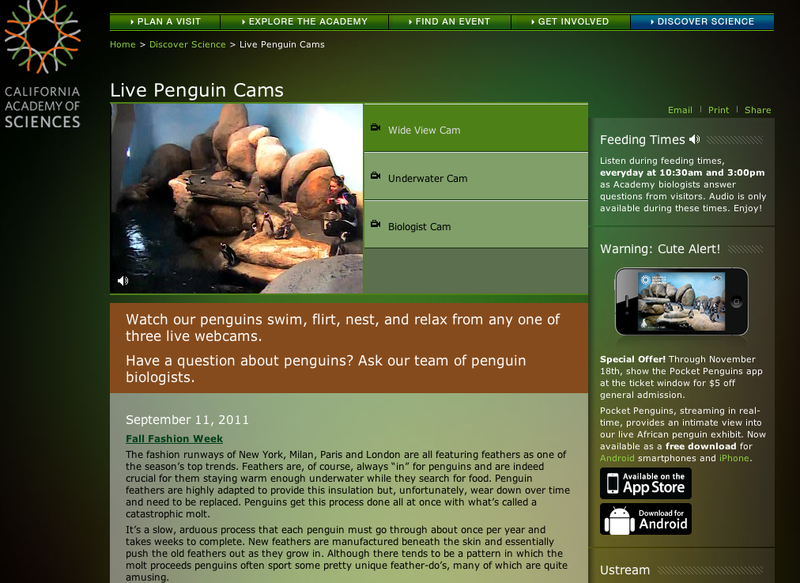 The organization has three primary distribution points for video - "Science Today", "Video Collections", and live streaming, which includes 24/7 webcam footage of select exhibits. This range of high quality content is key to the Academy's ability to engage with the general public, and it is also critical that content is accessible on all devices and platforms. The Academy began using the Brightcove Video Cloud online video platform in 2010 to manage its video content, including its highly popular 24/7 African penguin exhibit live stream. The live stream is also now available as a mobile app for iPhone and Android users thanks to Video Cloud, and has received more than 200,000 downloads on and was features in the iTunes App Store as the number one Education download. Fans can also donate $5 via SMS to the Academy within the app, and also receive special offers, such as reduced admission to the museum. In the future, the Academy hopes to leverage Video Cloud to create even more application-based video, using inexpensive consumer-grade cameras to capture all live exhibits in real-time before broadcasting to consumers using Video Cloud.